The long-complicated feud between Ted Cruz and Donald Trump, fraught with animosity since at least the Republican National Convention, is showing some signs of thawing. 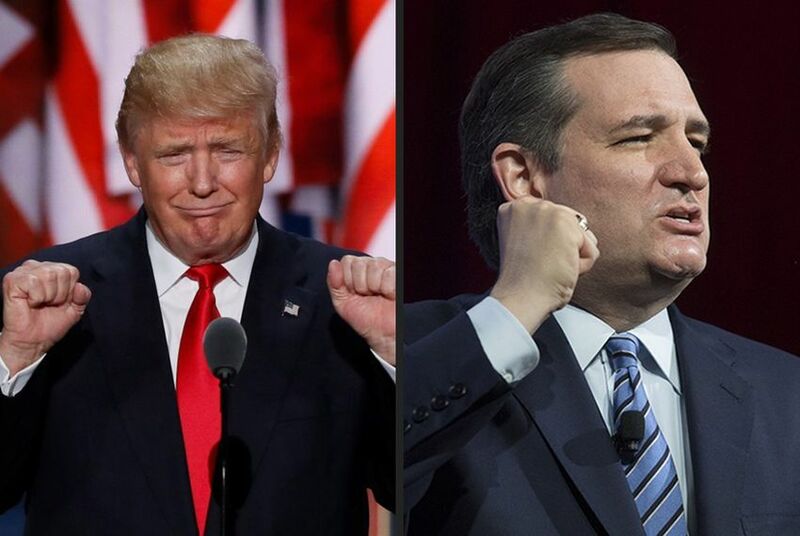 The long-complicated standoff between Ted Cruz and Donald Trump, fraught with animosity since at least the Republican National Convention, is showing some signs of thawing. On Wednesday, one of Cruz's top advisers suggested the U.S. senator is warming up to Trump — the first such signal since Cruz dropped out of the presidential race. Then the two former rivals found common cause in Cruz's highest priority now that he is back in the Senate: stopping the Obama administration from transferring oversight of the internet domain system to an international organization. The events amounted to the most Trump-friendly activity on behalf of Cruz since the July convention, where Cruz caused an uproar by delivering a primetime speech without offering any support for the nominee. In the ensuing weeks, Cruz largely went silent on the presidential race, hunkering down for a tour of his home state during the congressional recess and beginning to ramp up his efforts to help endangered Senate colleagues. On Wednesday evening, a Cruz spokesperson said there was "no change" in Cruz's position on Trump — but something nonetheless appeared afoot. Asked Wednesday morning about Cruz's standoff with Trump, former Cruz campaign manager Jeff Roe breathed new life into the possibility that Cruz could still get behind the nominee — something the senator never ruled out, however unlikely it seemed. At a breakfast hosted by Bloomberg, Roe said Cruz grapples on a daily basis with whether to back Trump and he thinks Cruz will "have an answer before Election Day." "To be honest, though, watching Donald run a better campaign lately has been helpful to him," Roe said, adding that Cruz has also been encouraged by the case Trump has recently been making against Democratic rival Hillary Clinton. Roe also said that Cruz's unequivocal opposition to Clinton and resistance to being a write-in candidate are "limiting his options on where he's going to go if he makes a decision." Hours later, Trump's campaign further fueled speculation of a detente when it issued a statement backing Cruz's crusade against the Obama administration's plan to hand over domain-name oversight to a global nonprofit known as the Internet Corporation for Assigned Names and Numbers. Critics say the plan would open up the Web to censorship by nations like China and Russia. The statement, issued by Trump policy adviser Stephen Miller, did not name Cruz but said "Republicans in Congress are admirably leading a fight to save the Internet this week, and need all the help the American people can give them to be successful." On Twitter, Cruz quickly thanked Trump, saying he appreciated the nominee's "support of our efforts to keep the internet free." Trump campaign manager Kellyanne Conway, the former president of a pro-Cruz super PAC, responded to Cruz with her own tweet, writing "we appreciate [Cruz] appreciating [Trump]. Over to you, [Roe]." In a statement, Cruz spokeswoman Catherine Frazier tamped down on the notion that Trump's involvement in the internet fight has something to do with Cruz's stance toward the nominee. "We are grateful to have his support in the effort to protect our freedom on the Internet," Frazier said of Trump. "Cruz continues to watch the race closely, no change to that end." People around Cruz have long been split on whether he should support Trump after a bruising primary that saw the billionaire repeatedly go after Cruz's family. Roe has been viewed as more in favor of Cruz easing up on his refusal to back Trump. Cruz has been particularly battered in some corners of Texas politics for not supporting Trump. This week alone, Lt. Gov. Dan Patrick, a former Cruz supporter, said the senator could be "left in the rearview mirror" if he does not get behind Trump, and U.S. Rep. Michael McCaul of Austin, who has not ruled out challenging Cruz in 2018, charged that Cruz "broke his word" at the convention. U.S. Rep. Michael McCaul, R-Austin, stepped up his criticism Tuesday of congressional colleague Ted Cruz, saying he "broke his word" by declining to endorse presidential nominee Donald Trump at the Republican National Convention. Lt. Gov. Dan Patrick, who has been quiet about U.S. Sen. Ted Cruz's lack of support for Donald Trump, warned Monday Cruz will be left "in the rearview mirror of the Republican Party" if he doesn't endorse the businessman.